Revolutionizing the way consumers indulge in healthy and convenient eating, we’re thrilled to introduce premium salad kits featuring ready-to-eat grilled chicken. Our new line of delicious, high quality protein-packed salads is the ultimate meal solution. 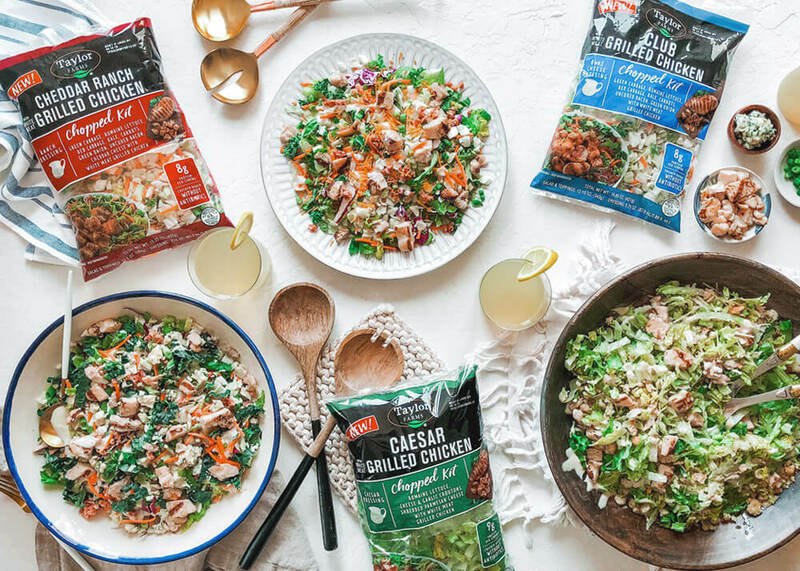 With ingredients you know and love (insert your favorite Taylor Farms chopped salad kit here, of course) — including fresh veggies, savory dressings and ready-to-eat antibiotic-free grilled chicken — our new Grilled Chicken Chopped Salad Kits deliver more than 30 grams of protein per bag. Hail to our new Caesar chopped salad with juicy grilled chicken! Loaded with 9 grams of protein and 4 servings per bag, that’s a whopping 36 grams of protein in this one convenient kit. A fresh blend of veggies, crunchy crouton crumbles, and shredded Parmesan cheese come together with creamy Caesar dressing and juicy grilled chicken for a tasty favorite! Learn more. Every bite is packed with flavor thanks to this dream team of crisp veggies combined with white meat grilled chicken, shredded cheddar cheese, crispy uncured bacon and a creamy ranch dressing to top it all off! With 8 grams of protein and 4.5 servings per bag, that’s 36 grams of protein in one convenient kit. Learn more. Uncured bacon and blue cheese? Yes please! With 8 grams of protein and 4 servings per bag, that’s 32 grams of protein in one convenient kit. Vibrant veggies and crunchy bits of uncured bacon are paired with juicy white meat grilled chicken and creamy blue cheese dressing – fresh and bold has hit a new level! Learn more. When we say premium entree salads, we don’t mess around. Our grilled chicken is raised without antibiotics, and all our ingredients are free from artificial colors, flavors and preservatives. Learn more about our Taylor Farms “100% Free From” label. Need another reason to love this product line? These kits are produced out of our Gonzales, CA-based facility, that has been recognized for its renewable and alternative energy efforts, in addition to its recent achievement of TRUE Platinum certification, the highest level of recognition awarded by the TRUE (Total Resource Use and Efficiency) Zero Waste program. With a retail of $4.99, you will find our premium kits at your local HEB, Albertsons, Safeway and Vons. We are all foodies at heart! Snap a shot of your original and delectable recipe inspiration using our new Grilled Chicken chopped kits and post to Twitter or Instagram tagging @YourTaylorFarms #GoToGreens for a chance to be featured on our feed. Want to get really trendy? Search for our NEW Gif stickers on Instagram – The 5 most creative IG stories tagging @YourTaylorFarms & using our new gif sticks will win a shipment of our NEW Grilled Chicken chopped kits. Winners will be announced 9/20/18 at 12:00 pm pst.